The vessel Starman is the perfect item to complete the Cosmic Diner, is a flower vase in porcelain made in the shape of an astronaut who brings to the table the pioneering spirit of Diesel and Seletti. 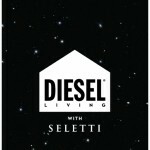 The result of collaboration between two popular Italian brands, Diesel Living and Seletti, Cosmic Diner is a collection of dishes inspired by outer space. The series won the 2015's Wallpaper Design Award and was presented at the Salone del Mobile in Milan 2015.